There's no doubt rock was the favoured genre in Australia throughout the '80s. Cold Chisel, Australian Crawl, The Angels, Midnight Oil, The Choirboys... the list of pub rock groups that enjoyed a stranglehold on the charts and radio play is endless. But this week in 1989, Aussie pop made a strong showing, with four of the ARIA singles chart's new entries. The other two debuts were by international pop acts - a sign that music tastes were changing locally. 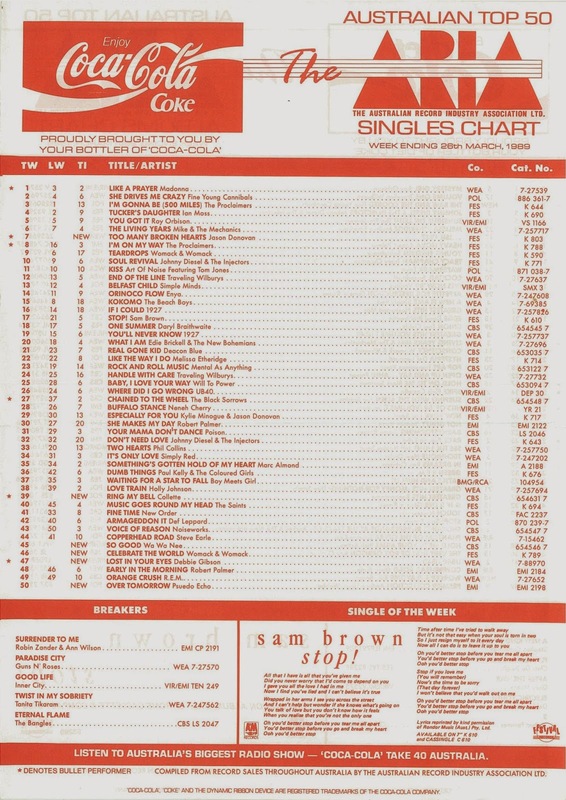 Sure, we weren't quite at the stage of R&B and dance tracks flooding into the top 50, but songs were no longer dependant on FM radio play or pub rock cred to become hits in this country. At the top of the ARIA singles chart was the Queen of Pop herself. Madonna resumed her throne, ousting The Proclaimers in the process, with "Like A Prayer" spending its first week at number 1. Five years earlier, the Welsh singer had embraced a sexier image and new sound. In 1989, that continued as she teamed up with the hottest US production duo in the business, LA Reid & Babyface, on this US number 2 hit. Last seen peaking in the 80s in 1986, Stephen Cummings broke a string of top 100 misses by returning to that section of the chart with this catchy single from A New Kind Of Blue. This non-album single was the former Smiths frontman's first new music since the Viva Hate album and was inspired by legendary East End London crime figures The Kray brothers. Her former singing partner, Kate Ceberano, would have a huge 1989 with the release of her debut pop album, Brave, but Zan Abeyratne wasn't as successful with her first effort away from I'm Talking. Last week, we saw Inner City's "Big Fun" as a breaker, and this week in 1989, it was the turn of follow-up single "Good Life" to just miss the top 50. It wasn't the first (or last) time that two singles by an act would simultaneously become hits (or, in this case, almost hits). With Australia notoriously slow to catch on to new international music in the '80s, it was often the case that by the time an artist landed their first hit here, they had a second single waiting in the wings and the two would chart alongside each other (see also: Mel & Kim, Bon Jovi, Melissa Etheridge). What a fitting title this would turn out to be - and it's interesting that arguably Australia's most successful synthpop act (six top 15 hits, including number 1 "Funky Town") would falter when they tried to inject a bit of rock into their sound (big power chords, albeit played on the keytar) and their look (shirtless drummer, stupidly long hair). The second single from Race, "Over Tomorrow" was hardly "Run To Paradise" and it wasn't enough to sway the rock-loving public to start listening to Pseudo Echo. Plus, by leaving the sound that made them a success behind, the band also alienated their existing fans, with this song becoming their final top 50 appearance. Only one of the five singles from Debbie's debut album, Out Of The Blue, had breached the ARIA top 50 ("Shake Your Love" reached number 27), but piano ballad "Lost In Your Eyes" started the teen singer/songwriter/producer's second album campaign on the right note. The lead single from Electric Youth, "Lost In Your Eyes" became her first big Australian hit and as well as giving her a second US chart-topper. It was a song I could actually play on the piano at the time. Yep, my Debbie obsession prompted me to shell out for the sheet music to this song. Often wrongly considered to be a one-hit wonder in Australia, husband-and-wife duo Womack & Womack did indeed score a second top 40 hit with this follow-up to "Teardrops" - even if it performed nowhere near as well. While I've grown to love "Teardrops" over the years, I can't say the same about "Celebrate The World", although the chorus has that annoyingly hummable quality to it. This would be the last time we'd see Linda and Cecil on the Australian chart, with the couple going on to perform under the name The House of Zekkariyas... as you do. While Pseudo Echo abandoned their roots and stumbled, Wa Wa Nee were also having trouble landing a decent hit - and they were still releasing synth-based funk tracks. "So Good" became the group's second single in a row to stall outside the top 30 and would be their final top 50 appearance. For me, the singles from second album Blush (like this and previous release "Can't Control Myself") were nowhere near as good as those from Wa Wa Nee's debut album, so they probably didn't warrant higher chart positions - but it was nevertheless a shame to see a band that'd shown such promise crashing and burning. If bands like Pseudo Echo and Wa Wa Nee that wrote their own music, played their own instruments and had some international success couldn't cut it with the narrow-minded Australian industry, what hope did a bicycle short-wearing model have of gaining any respect? Pretty much zero. Of course, who needs credibility when the top 5 beckons, right? Performing a vaguely house-inspired cover of the Anita Ward 1979 disco classic, Collette Roberts was clearly Australia's answer to Yazz. She even had smiley face badges pinned on her outfit to prove how down with house music she was. "Ring My Bell" spent three weeks at its peak position, but Collette quickly became even more derided than Kylie Minogue was at that point in her career in Australia - and Kylie had a pretty rough time of it in 1989. I wasn't a fan of "Ring My Bell" or the obvious way Collette was styled. It all came off as trying just a little bit too hard - but at this stage, at least, it worked. Speaking of a lack of credibility... Also spending three weeks at its peak position, Jason's second single on his own was a vast improvement on debut hit "Nothing Can Divide Us". Instead of giving the Neighbours star (he was in his last two months on air) a Rick Astley cast-off, songwriters/producers Stock Aitken Waterman provided Jason with what would be the best single of his career and it rushed to number 1 in the UK. In Australia, "Too Many Broken Hearts" became Jason's third top 10 appearance in a row. Nevertheless, the local industry was even more savage on Jason than on his girlfriend and record label-mate. The fact that he walked around the tourist advertisement-style music video playing an electric guitar that wasn't plugged in to anything didn't help. Next week: new entries are a bit thin on the ground, so I'll also take a look at what was happening on the albums chart in 1989. I remember being surprised by 'Lost In Your Eyes'' success and chart longevity in Australia, given that Debbie's debut album spawned only one minor hit. The song seemed quite popular at the time at my school, but it's funny now that it seems to be all but forgotten in Australia, with the much less-well charting 'Electric Youth' being remembered by her (if anything) instead. I think the 'Celebrate the World' video was the moment where I finally realised (after some debate with my sister) that the main Womack & Womack singer was indeed a woman, and not a man with a high-pitched voice. Rage aired the extended 'boobies' version of the 'So Good' video when it dented the top 50, quite surprisingly. I remember thinking that it was a bit naughty. 'Ring My Bell' didn't have a video made until it cracked the top 20, from memory... although Collette's memory (on the 2006 'Where Are They Now?' segment) of this was a bit off; she said they didn't shoot the video until it was top 5. She also said that she didn't mind being "#2" on the chart behind Madonna; another inaccurate memory. Collette also stated that the whole lycra image for the video was not a manipulated or pre-planned one. She said something like "the clothes were there, and they were free." It always bugged me that Jason was strumming an unplugged electric guitar in the 'Too Many Broken Hearts' video... particularly since there doesn't seem to be a prominent guitar for most of the song. Like the 'Nothing Can Divide Us' video, Australia received a slightly different (and better, IMO) edit of the video than that aired in the UK, with the scenes suggesting that he was hitchhiking removed, and some additional scenes of his 'ex-girlfriend' on the tractor and Jason visiting her house. I can see why the hitchhiking scenes were cut, but I wonder what the impetus was for the other different edits? The ESL/Engrish-like "there's too many dreams can be broken in two" lyric has always bothered me. Even with a comma placed after the 'there's too many', it still sounds stupid to my ears. Debbie wasn't popular at all at my school - I think there was me and one other kid who flew her EY flag. I never thought of the comparison of the same dress code with Yazz and Collette. Maybe when Collette was on 'Where Are They Now?' she was referring to 'Ring My Bell' being No.2 on one of the state charts, but yes, I do find it funny when artists have no idea when they released singles and the chart positions. I guess they are always too busy in the moment to reflect as long as it's a hit they're happy. Nathan, that is funny about the questionable gender of the lead singer of Womack & Womack. I remember when Tracy Chapman came onto the scene and I was watching the video for 'Fast Car' at a friend's place and his mother said 'I swear that's a bloke!'. That was funny and has stuck in my head over all these years. I'm sure there are some artists who scour the charts to see where their songs land, but I never got the impression Collette took it all overly seriously. My enduring memory of her comes from a fumbled performance at a telethon - Betty Boo style. Oh, forgot to add, another artist who had 2 singles sitting side by side in the charts was Alannah Myles with 'Black Velvet' and 'Love Is', but I guess we won't be touching on that topic again til about another 54 weeks or so. I didn't fully get into the charts until 1991 when I was 8, and that lasted throughout the 90's but lost interest in 2000's though still take a peek at what's happening. Just thought I'd comment (2 years late I know but I just found this amazing blog) about Collette. She was my first real love as a 6 year old lol. I was so in love with Ring My Bell. Hey Gavin, the Collette video's back on youtube now! (and has been for some months) So glad the record company saw the error of their ways. The Chimes videos are back too (it was CBS artists affected) - not sure if you linked any of those. OMG finally someone talks about Collette on Where Are They Now? saying she got #2 and was stuck behind Madonna. Though it hit #5 on ARIA I've always had a distant memory of it reaching #3 on another chart (was Kent still running at this time?). But there was certainly NO #2. I didn't know there were alternate vids for Jason D's "Too Many Broken Hearts" and "Nothing Can Divide Us" for the UK. I'd completely forgotten that Celebrate The World existed but the moment I saw the title I started humming it in my head. Not a big hit but it definitely had an earworm hook. I remember Love Is and Black Velvet by Alannah Myles charting simultaneously, I think from memory ADIVA had 2 songs do the same thing (as well as Mel & Kim, Bon Jovi etc as mentioned). I've always gotten frustrated when an act's follow up to a hit charts and drops off the top 50 before the prior hit has even finished it's run. I always imagine them sitting in the record company going "Great.... what do we do now??" I've uploaded the Australian edit of the 'Too Many Broken Hearts' video here - https://www.youtube.com/watch?v=ebvj-RPS6jA . It appears to have disappeared from the search results. Re: People seeming to remember Electric Youth moreso than Lost In Your Eyes by Debbie Gibson I think it's a bit like Martika - people remember the term "Martika's Kichen" as it was a single and album title, even though thesingle wasn't a big hit. Due to Electric Youth the album getting Top 10 in OZ I kinda think people just remember the term Electric Youth rather than the underperforming (in comparison to the previous single) tune or lyrics of the single. In the Smash Hits book that got released a few years back by some ex-writers from the mag they spoke of how Collette was the model girlfriend of one of a CBS record company execs. They wanted their own answer to Kylie and thus Collette was put in the studio and Ring My Bell was born, I remember when she came out - a story about her shopping a demo around was doing the pop music mag rounds which was obviously not true. But then Kylie talked about shopping demo's around pre-Locomotion when accepting the ARIA Hall Of Fame award, which seems to be another little lie told to try and give dispel any "Oh I just fell into my singing career by accident" feeling. Collette could well have been referring to her chart peak in her home state (NSW or Vic?). I remember reference being made to Madonna's "Holiday" peaking at #2 in Australia, but that was only in Victoria (it peaked at #4 nationally). It wouldn't surprise me at all if Collette had been told by her record company that she was "#2 behind Madonna" in her home state (which is highly plausible, given that it spent weeks in the Top 5). I always found the state charts fascinating.